Formative assessment emphasizes decision-driven data collection instead of data-driven decision making. As I planned our Special Right Triangles lesson for Wednesday, I decided what questions to ask based on what was essential to learn. Level 4: I can use the Pythagorean Theorem & special right triangle relationships to solve right triangles in applied problems. Level 3: I can solve special right triangles. Level 2: I can use the Pythagorean Theorem. Level 1: I can perform calculations with squaring and square rooting. We started class with a Quick Poll. I was surprised at how long it took students to get started. I hadn’t planned it purposefully, but the way the triangle was given forced them to make more connections than if the two legs had been marked congruent. Eventually, everyone got a correct answer (and the opportunity to learn more about using the square root template) using the Pythagorean Theorem. I asked them to determine the hypotenuse of a 45˚-45˚-90˚ triangle with a leg of 10 next. As soon as they got their answer, they announced “there’s a pattern”. They conjectured what would happen for legs of 12 and 7. I asked them to select a number between 20 and 100 for the leg and convince themselves that the pattern worked for that number, too. I loved, though, that the first student whose work I saw had to convince himself that it worked for a side length of x before he tried a number between 20 and 100. I took a picture of his work and let him share it later in the class. Students shared their results with the whole class, and then I sent another poll. Which led us to reverse the question using the incorrect answer. If √6 is the hypotenuse, what is the leg? And then a poll to determine the leg given the hypotenuse. And another poll to determine the leg given the hypotenuse. I set the timer for 2 minutes and asked students to Doodle what they had learned, using words, pictures, and numbers. And I was pleased that more than the majority took their doodles with them when class was over. I sent this poll first thing on Friday. Students gave these responses after working alone for 1-2 minutes. I didn’t show the results, and got these responses after students collaborated with a partner for next minute or two. When I gave a similar question a previous year, allowing collaboration, the success rate was informative but abysmal. And so the journey continues … focusing on decision-driven data collection, giving my students and me the opportunity to decide what do next based on “short-cycle” formative assessment. How Do Your Tests Make the Grade? For several years now, I’ve been learning from Jill Gough about #LL2LU (Leading Learners to Level Up). It’s taken a while, and it is always a work in progress, but we are definitely convinced that writing learning goals for our students in language that they can comprehend is important and makes a difference in their learning. Level 4: I can determine the congruence of two figures using rigid motions. Level 3: I can map a figure onto itself using rotations. Level 2: I can identify and define rotations. Level 1: I can apply and perform rotations. Last year, Jill Gough wrote several blog posts about assessing the quality of the assessments that we give, which led me to Beyond the Common Core: A Handbook for Mathematics in a PLC at Work, High School, by Mona Toncheff and Tim Kanold. Kanold and Matt Larson have written a Leader’s Guide for the handbook in which they offer an Assessment Instrument Quality – Evaluation Tool and a High-Quality Assessment Diagnostic and Discussion Tool. (If needed, you can access the reproducibles through the Leader’s Guide page – Figures 1.11 and 1.16) I also had the opportunity to attend Mona’s session on these tools at either NCSM or NCTM (the sessions run together). Jill’s posts and Mona’s session made me think that while the assessments we give might not need a complete overhaul, they definitely needed some overhaul if we agreed with the Level 4 Descriptors in the Assessment Instrument Quality Evaluation Tool. How do your assessments measure up on the following indicators? While our learning standards throughout the unit are clear, we don’t typically include them on the assessment. And in fact, I wasn’t sure that I wanted to include all of them on the assessment. Wouldn’t the learning goal give away what to do on some of the test items? While our assessment is neat, organized, and easy to read, we typically don’t allow students to write on the test (because that would require more time standing at the copy machine). So they aren’t well-spaced and there is no room for teacher feedback. We changed the last geometry test of last year and the first calculus test of this year to meet the indicators on the assessment evaluation tool. I like how our goals for the unit were on the test to remind/help us in what we are looking for. I love the new format. It allows me to go to the sections I can do quickly immediately and save the most difficult problems for last. Because of this, I was able to have enough time to complete every problem. I like that is shows our goals for the unit. This made me feel like the work I was putting in meant something. The formatting/competencies let me know which skills I needed to use. It kept me from getting confused like I usually do. I like the formatting because it keeps similar questions next to each other. This way we can focus on one thing at a time. I like how it starts with basic skills then gets harder. It’s like a warm-up for the end. I like this new formatting because it gives me more space for my work and it won’t be so hard to notice which work goes with which problem. I feel like the new format for the test. It is a lot more organized and easier to read through. On previous tests, the pages felt crammed and a little disorganized. This is an improvement. 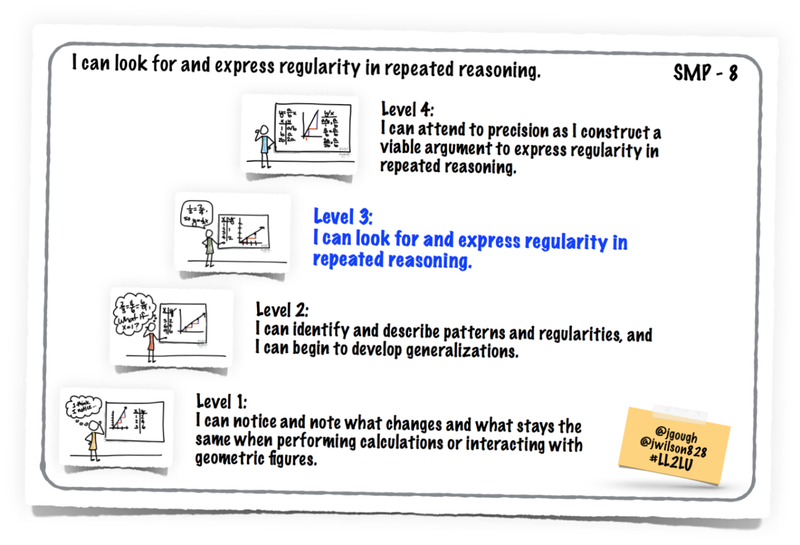 Level 4: I can integrate geometric and algebraic representations to confirm structure and patterning. Level 3: I can look for and make use of structure. Level 2: I can rewrite an expression into an equivalent form, draw an auxiliary line to support an argument, or identify a pattern to make what isn’t pictured visible. Level 1: I can compose and decompose numbers, expressions, and figures to make sense of the parts and of the whole.